Big city turn me loose and set me free. There is no easy way to tell you what a Rogue River trip is like. It really touches your soul, it sets you free, and it gives you a gift. The wild, the wilderness, how it changes me and how it will change you. Your heart will thank you. Rock n roll rapids and as tranquil as a butterfly. Creeks so clear they sparkle from within. Come swim in the sun, play on the water where the river flows into the vast ocean. Where the salmon and steelhead return to their home gravel beds to start the next generation. We can only give you a hint of what it is like and still every river trip stays with me from day to day and when I’m lucky fills my dreams with adventures beyond the imagination. Dear Friend Deano is enjoying another fine summer as a Roger River Guide. 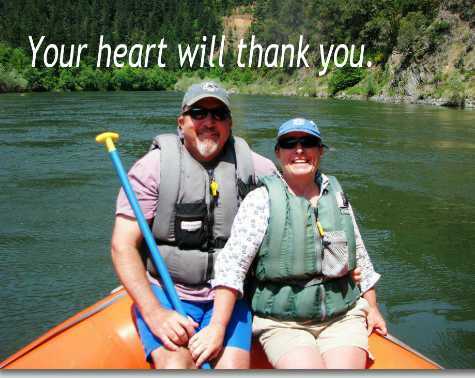 He works for Roger River Rafting and invites our readers to join him for a trip on that legendary river. Click here for his company's website. Thanks, Deano, that's a fine piece of prose you wrote while staying at the riverside lodge the other night. GOOD JOB!